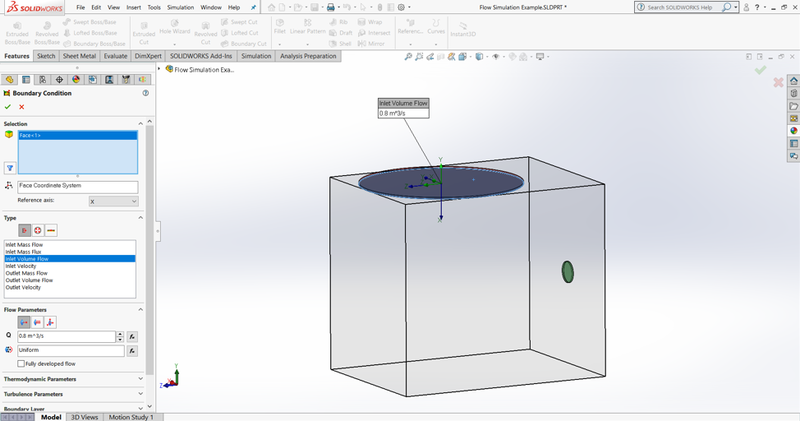 What is SOLIDWORKS Flow Simulation? 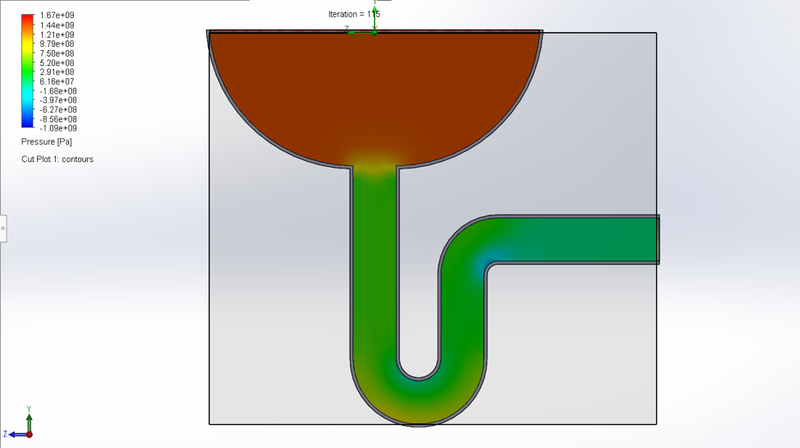 What is SolidWorks Flow Simulation: SolidWorks Flow Simulation is a Computational Fluid Dynamics (CFD) solution built in to the SolidWorks ecosystem. SolidWorks flow simulation is purchased as a separate package from the basic SolidWorks License. It is a powerful system that can simulate the behavior of different fluids with a variety of different variables including temperature, turbulence, pressure, flow velocity, and many others. SolidWorks is one of the most popular CAD packages in industry use today. As it has gained in popularity SolidWorks has developed into not only a complete CAD package, but an impressive simulation suite as well. 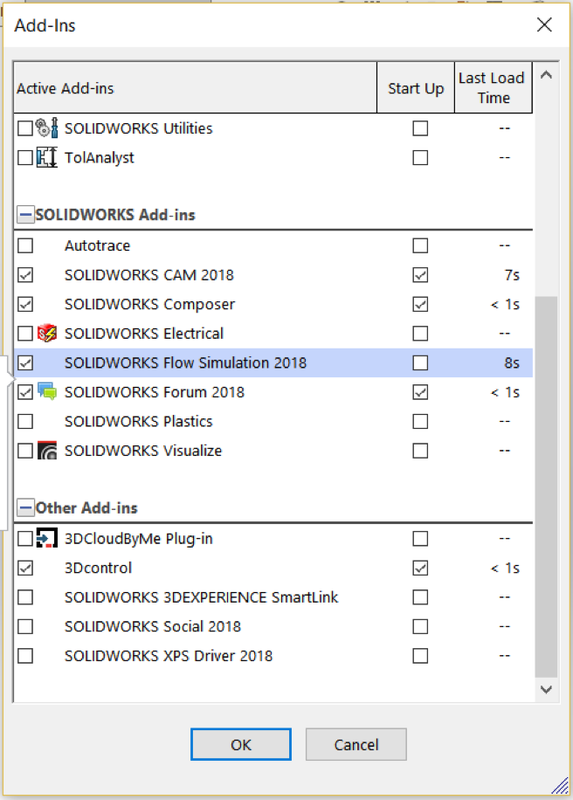 One of these simulation programs is SolidWorks Flow Simulation. 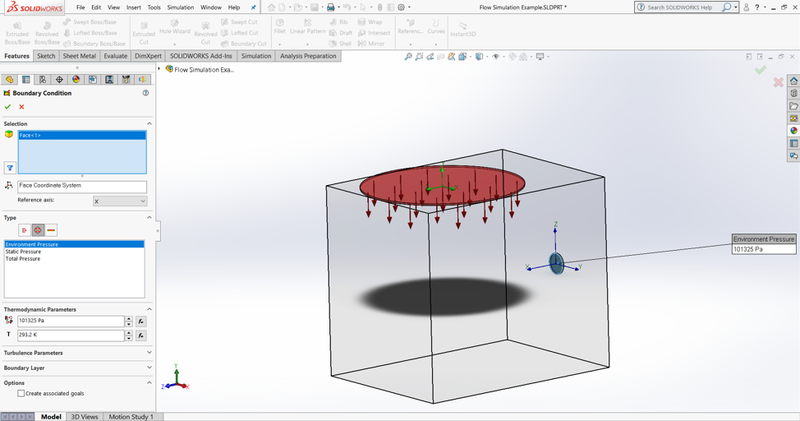 SolidWorks Flow Simulation preforms what is known as Computational Fluid Dynamics (CFD) computations. Simplified, this means that it calculates fluid behavior under specific conditions. 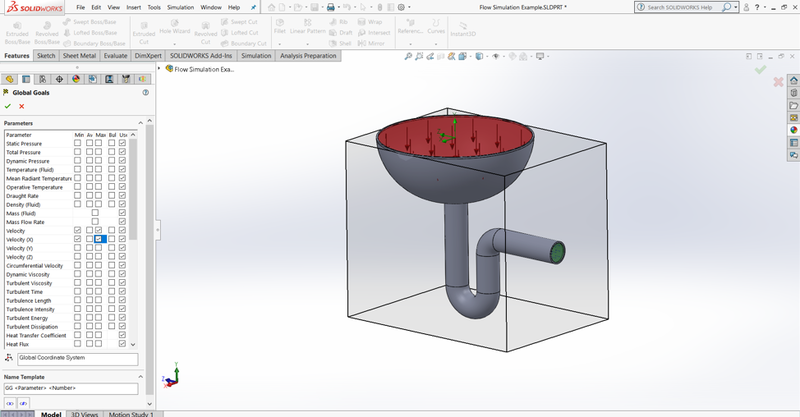 Today, we’ll look at some of the basics of SolidWorks Flow Simulation including how to access flow simulation, the basics of the flow simulation wizard, and running a simple simulation. 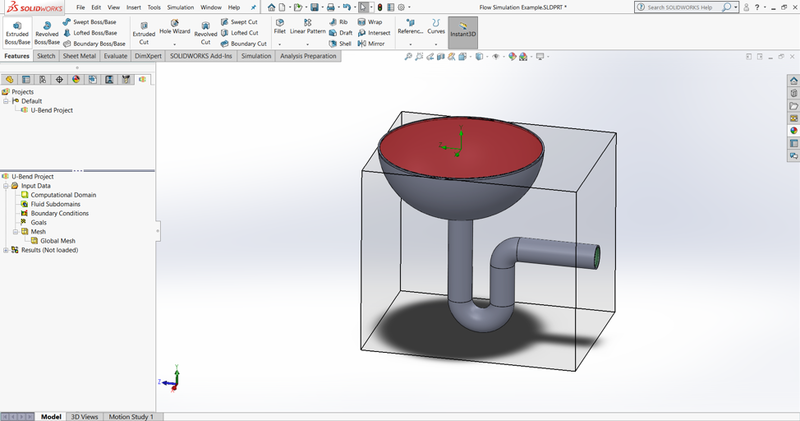 When considering the basics and capabilities of flow simulation, a great place to start is always the literature that is provided by SolidWorks (we provide some links at the end of the article). We won’t take the time to rehash all of that here, instead, let’s take a look at the capabilities by quickly working through the Flow Simulation Wizard. To access flow simulation, first go to “Add-Ins” and make sure that the flow simulation check box for “Active Add-Ins is selected. Once the add-in is active, you can activate a new project by going to Tools > Flow Simulation > Project. From there you can see that you have the “New” option as well as the “Wizard” option. For the purposes of this article, we will select the “Wizard” option. Starting a “New” project from scratch is geared towards advanced projects, and users who are already well versed in the use of SolidWorks flow simulation. 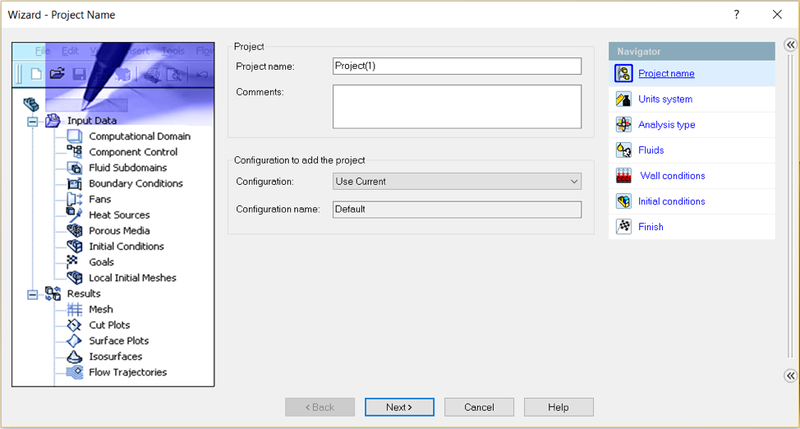 When you select the project wizard you see the following menu. 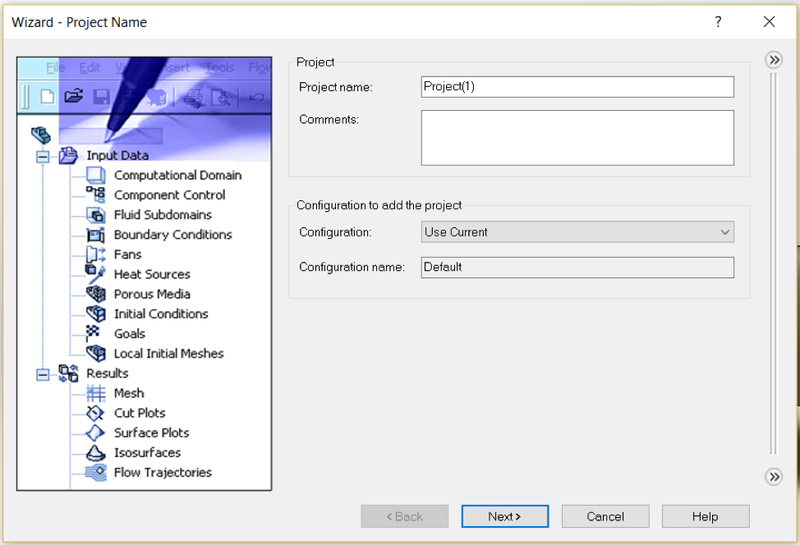 The wizard starts with the “Project Name” dialog. Here we can name the project, add any relevant comments and select the configuration that we intend to use. If we click the arrows on the right side of the window, we can also see all of the steps that the wizard will walk us through. This also allows us to jump back and forth between steps if necessary. We will name our new project “U-Bend Project.” clicking next brings us to the “Units system” dialog. From here we can select a predefined unit system, define our own unit system, and view all of the defined units and levels of precision for any of the parameters that may be involved in the project. This list is quite long, and includes units that many people unfamiliar with fluid mechanics will not have encountered before. 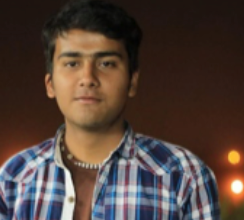 You can start to see why a background in fluid sciences is necessary to get the most from this powerful software. For this example we will use SI units. Our next set of options comes in the form of the “Analysis type” dialog window. Here we have some options that once again require a fluids background to fully understand. Since the purpose of this article is primarily introductory, we will not describe all of the options available here, but provide a brief overview of the options you see above. 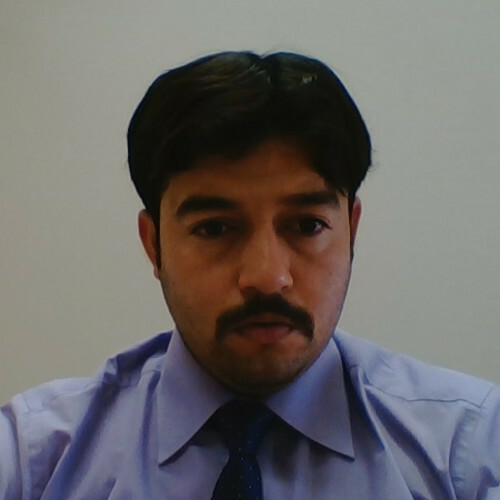 The analysis type gives an option between Internal and External flows. As would be expected, Internal flow describes flow in a closed volume, and external flow describes flow over objects in an open space. 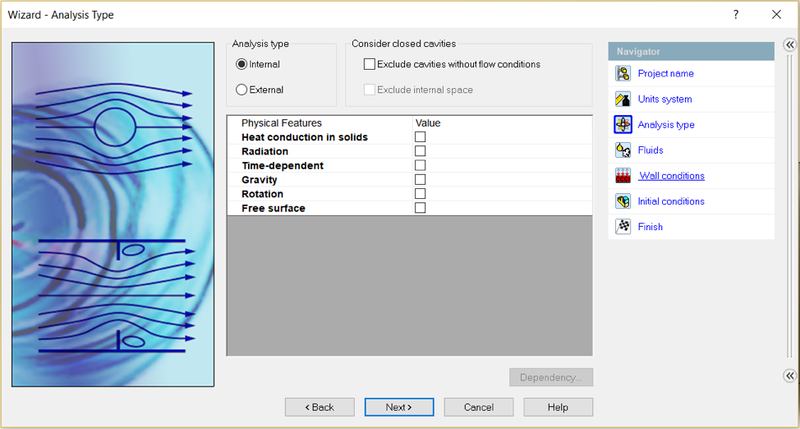 The options for “Consider closed cavities” provide options to exclude certain areas to reduce calculation time. “Physical features” options allow you to modify the project to include the listed options. Some of these options have other parameters when you select them, some can only be active if others are not, and others require other options to be active to be selected. 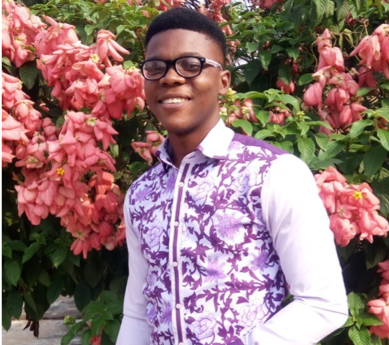 The wizard will tell you of these limitations as you make selections, but an understanding of what these options do is necessary for implementing them correctly. For this project, we will select internal flow, and we won’t use any of “Physical Features” options, just know that they are options for studies within the flow simulation work space. 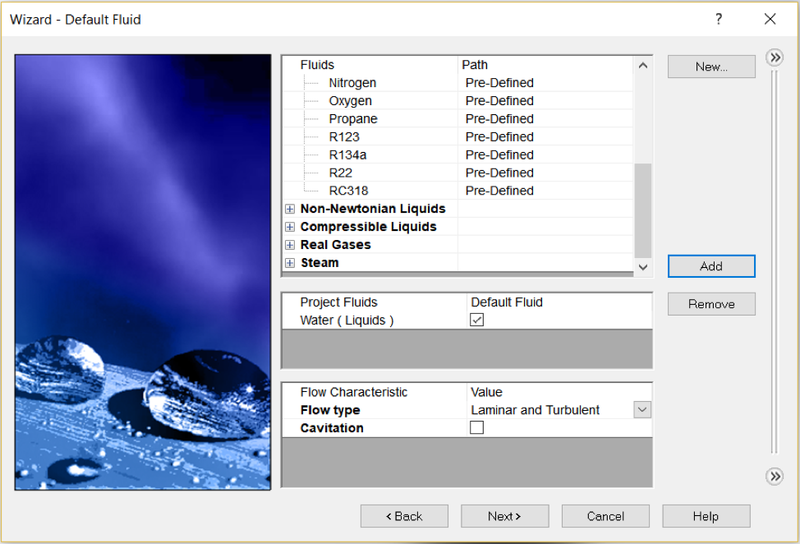 The next dialog window is labeled “Fluids.” This window allows us to select what fluids will be present in the study, as well as what the flow conditions will be. 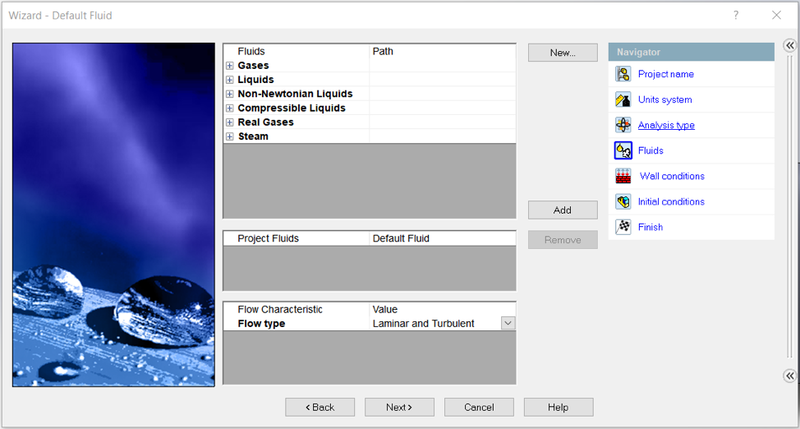 We can see from the dialog box above, that we have a number of options for the fluid that include liquids and gasses. If we choose to, we may also define a custom fluid by selecting the “New” button in the top right corner of this dialog window. We can also select our flow characteristic to be laminar, turbulent, or a combination of both. Once you have added a fluid other options may become available as shown below. You may add multiple fluids to the project if you desire, and your list of selected fluids will allow you to select which one to treat as default. 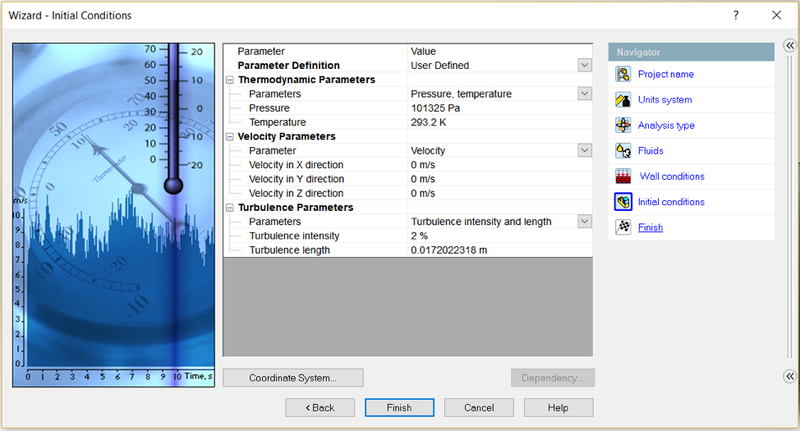 For this example we will select “Water ( Liquids )” with the “Flow Type” set to “Laminar and Turbulent” and “High Mach number flow” selected. Moving on to our next set of options, we see wall conditions. As you can see there are only two default options here. The first is the “Default wall thermal condition.” We won’t spend so much time on this option as it requires some knowledge of thermodynamics to understand properly, and, if you have this knowledge, the options are fairly self explanatory. That said we will try to give a brief explanation that can be easily understood since you must pick an option. The first option is “Adiabatic wall” which can be thought of as perfectly insulating. The next two options are “Heat flux” and “Heat transfer rate”, and they are both different ways to describe how easily the wall transfers heat. 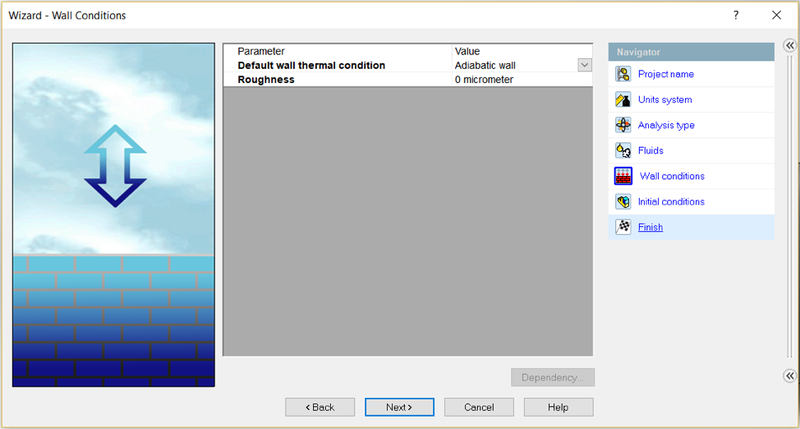 Finally, we have “Wall temperature” which maintains the wall at a constant temperature throughout the simulation. The only other option here is “Roughness” which changes how the solver will perceive the surface finish of the wall. We will leave these options at their default setting. The final category is labeled “Initial Conditions.” The options found here will dictate the starting conditions of the fluid in your simulation. 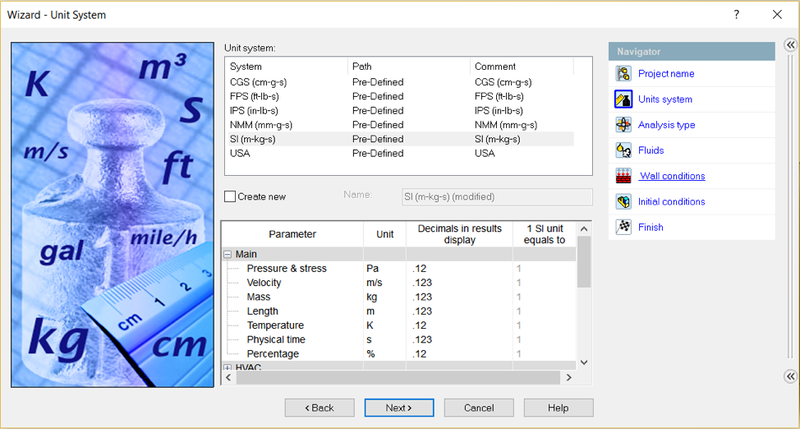 Starting at the top, “Parameter Definition” should usually be left as “User Defined,” but as you gain experience, you may also import initial conditions from the results files of another simulation. The “Thermodynamic Parameters” allow us to choose between setting pressure and temperature, pressure and density, or temperature and density. For our “Velocity Parameters, we can choose either the velocity or the mach number. Regardless of our choice, this will be set as a vector in “X,” “Y,” and “Z”. Finally we may set the turbulence in either intensity and length or by energy and dissipation. These fields are set to standard temperature and pressure conditions by default and that is what we will use for our example. 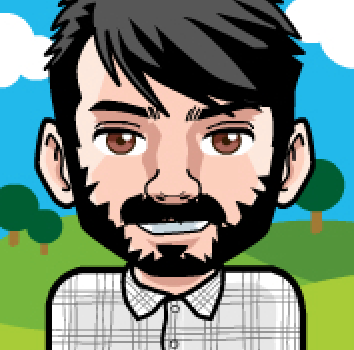 Once we have finished using the wizard this is what our example looks like. The flow wizard automatically creates a box that defines our computational domain. Note that with an internal flow project, there must be an enclosed volume. The inlets and outlets should be covered with seperate bodies called lids. For clarity we tend to use color to define lids, using transparent red for inlets and transparent green for outlets. If you do not have lids, you will receive a warning upon finishing the wizard and will be prompted to use a tool that helps make lids automatically. The last things this intro will cover are boundary conditions and goals. To define a boundary condition, we hide the main body so that we may select the inner faces of our lids as shown below. 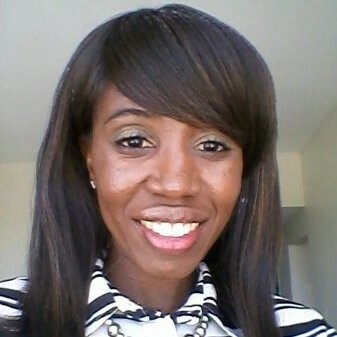 There are more options than are beneficial to explain here just know that this can set the conditions beyond our lids. In this case, we set our inlet to push our default fluid in at a constant inlet volume flow of .8 m^3/s. Similarly the outlet will be set but to a constant, but rather than a velocity, we declare the opening to be at atmospheric pressure. Now we are ready to run the study. By right clicking on the title of our project, we are presented with the run option. 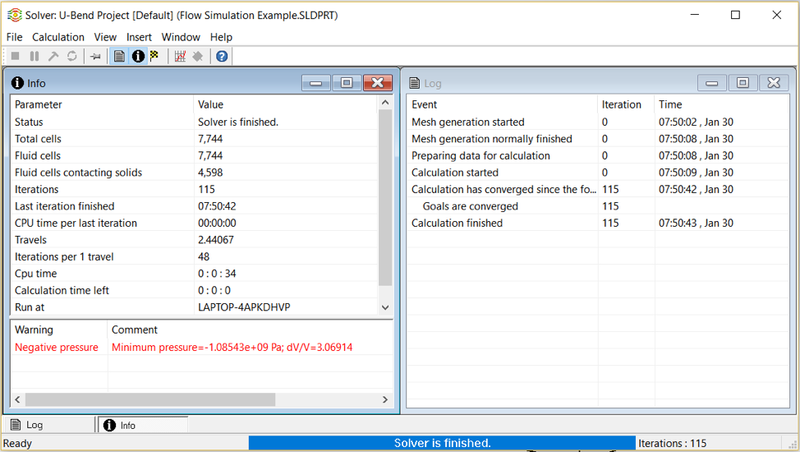 When we select to run the study, the solver window will pop up automatically as shown below. As you can see, this window will warn us as it solves if there is anything wrong with the project. In this case we have a warning stating that there is negative pressure. 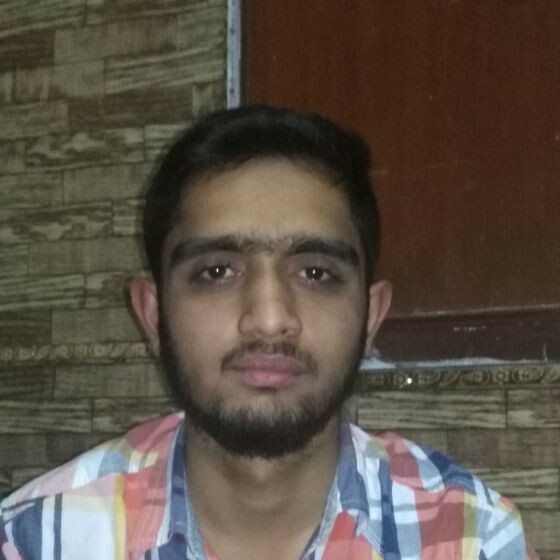 To locate this problem section we can declare a cut plot. Once we have our settings where we want them, a section view will help us see the results. It is plane to see with this view where the negative pressure is occuring. As you can see, tools like this could prove invaluable for evaluating a new design. In this case, the inlet flow volume is far higher than would normally be seen for this type and size of U-bend, which is likely why we have the issue. If we reset the inlet flow to something more reasonable, such as .01 m^3/s, the issue disappears, and we can continue studying our desired parameters. Solidworks flow simulation is a powerful tool. 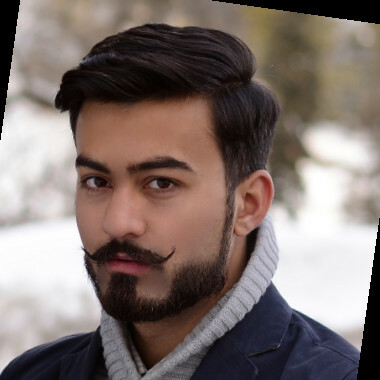 While it does require specialized knowledge in fluid mechanics and thermodynamics, hopefully you can see that this software has powerful abilities to analyze a design. When utilized properly, SolidWorks flow simulation can identify and help eradicate problems even before the first physical prototype is made.